Avalon Wasteneys, a 19-year-old UVic Vikes women’s varsity rower, beat a field including 100 of the province’s top 14-25 year old athletes on the weekend to be named RBC Training Ground BC regional champion. Wasteneys went into the Vancouver regional final after being named top female competitor at the February 19 regional qualifier held at the University of Victoria. She is a Vancouver Island native, originally from Campbell River. Wasteneys won a silver medal as part of the women’s 8 boat at the Canadian University Rowing Championships in November 2016, helping the team to a third place finish at the event. “UVic has helped me by providing determined and talented teammates that give me something to strive towards,” said Wasteneys. On March 4 at the Burnaby Oval Wasteneyes competed in Olympic benchmark tests against the top qualifiers from regional events held in Burnaby, Prince George, Langley, Kamloops and Victoria. 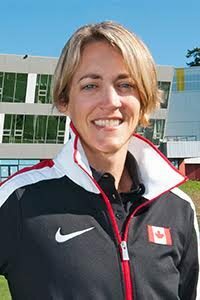 With the victory, Wasteneys earns future Olympic funding from RBC, up to $10,000 for up to three years, to be administered by Rowing Canada and a trip to the 2018 Olympic Games in Pyeongchang (to experience a Games first-hand). “Obviously every dedicated athlete dreams of going to the Olympics, but considering I have only been rowing for around a year and half, I have far to go before that dream can realistically become a goal,” said Wasteneys. Wasteneys, first found national success as a cross-country skier as part of BC ski team, where she won silver in Junior Girls 1 division at 2014 Cross Country Ski Nationals in Cornerbrook Newfoundland. In the summer of 2015 she made the decision to switch sports from skiing to rowing. “Although I loved the sport, I made the practical decision to switch to rowing because I knew that in Canada there were limited options for getting a university degree while also competing at a high level in skiing,” said Wasteneys. Other Vikes that recorded standout performances at the RBC Training Ground were fellow rowers Alec Stapf and Kirsten McKay. Stapf had the top male performance at the Endurance Station, while McKay posted the top female performance at the Strength Station. RBC Training Ground is the Canadian Olympic Committee’s (COC) and RBC initiative to bring new and undiscovered athletes into Canada’s Olympic talent pool. The program gives local athletes – no matter what sport they are involved in – the chance to test their strength, speed and endurance in front of officials from 11 Olympic sports, and earn ‘Future Olympian’ funding from RBC. In 2016, the first year of the program, 25 athletes earned funding and are now working with National Sports Organizations to help bring their Olympic dreams to life.